Flat folding. Use in restaurants cafes, beaches or camping. Airline or vessel carry ons. Backpack, ground spikes, belt straps incl. 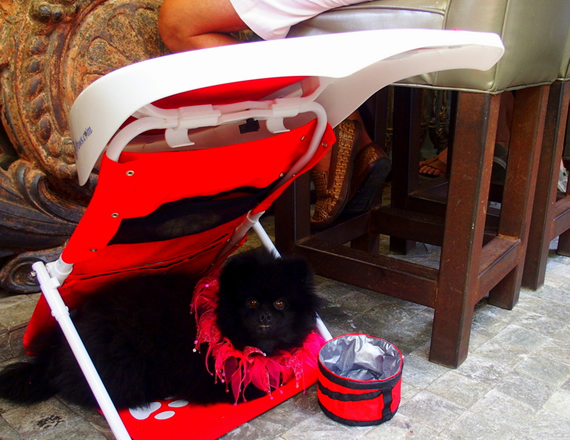 Protect small or large pets from sun in outdoor restaurants, cafe's, beaches, boats or backyard! or ground offering instant shade. 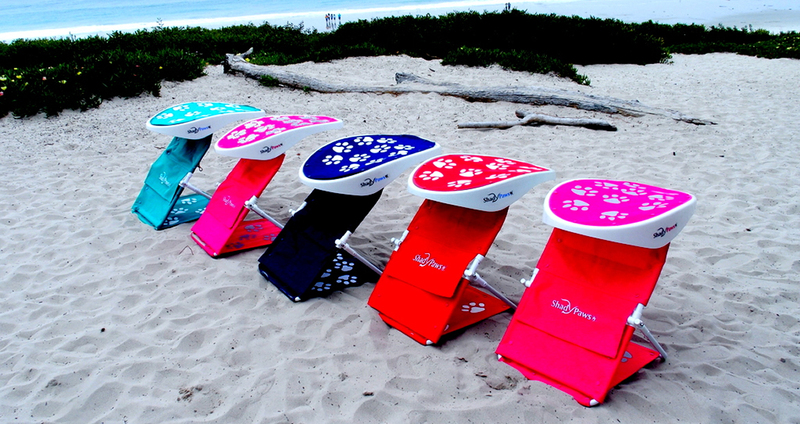 Rainbow of colors to protect dogs from sun. Carry bag, ground spikes and belts included! I love this product. Since I travel all the time with my German Shepard, I frequent places such as the beach and restaurants hotels and resorts where there is no shade. 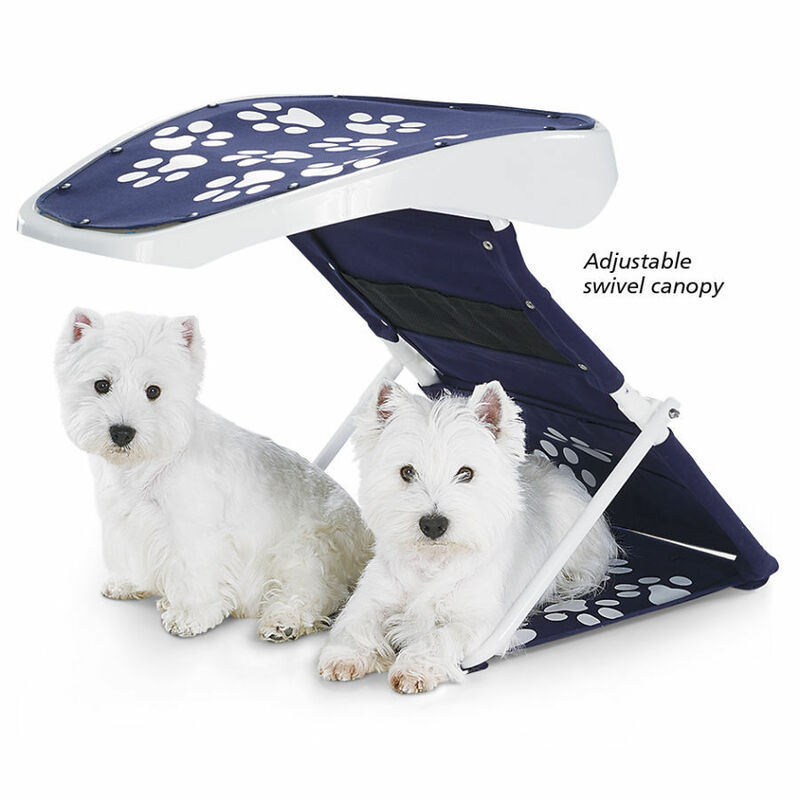 With the swivel canopy, it adjusts to, Ronny (my pet) when he lays next to me shaded with this product. I bought two. 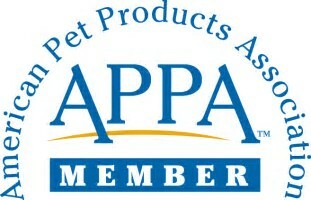 Gave one to my vet and she loves it for her two Pomeranian’s. Great Idea. I fits in my camper since it folds flat. I take my pet everywhere. Finding shade was always a problem. Now with this product I never worry about keeping my dog cool. The back pack is also convienient. Great idea. 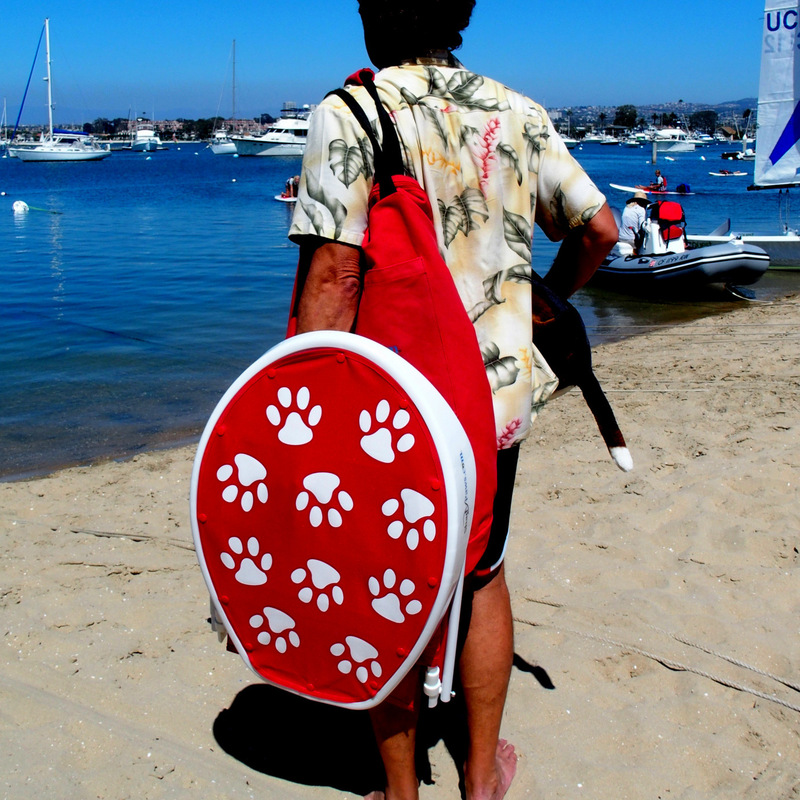 ShadyPaws, Inc. are perfect for family’s trips or business travel with dogs when flying to the Islands, resorts, hotels or vessels. 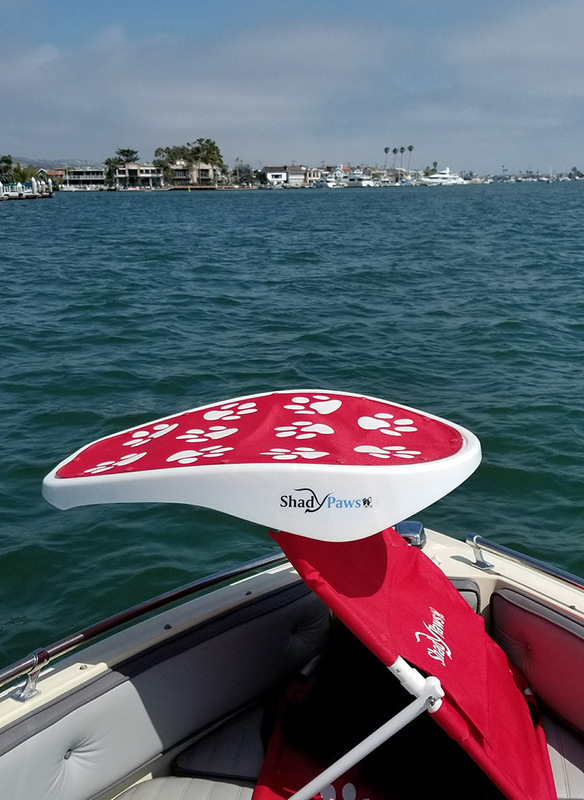 ShadyPaws, Inc. can be brought on board as a carry-on in overhead compartments or on boats and yachts. 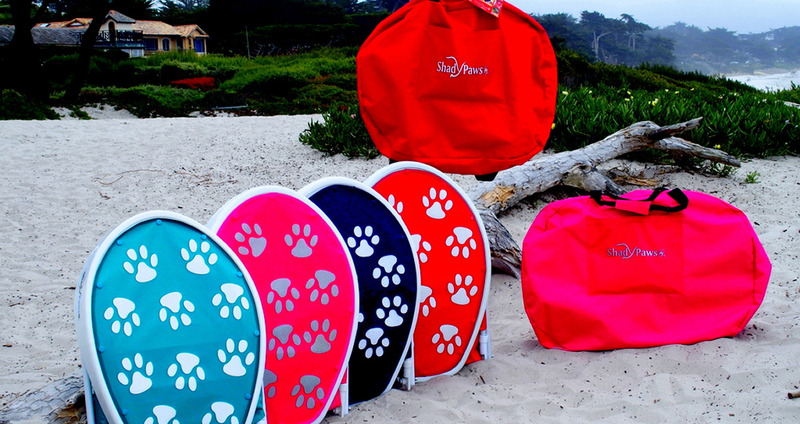 ShadyPaws Portable Pet Canopy Sunshades are flat folding and portable when bicycling to the beach or venturing out to hotels and resorts with pets. 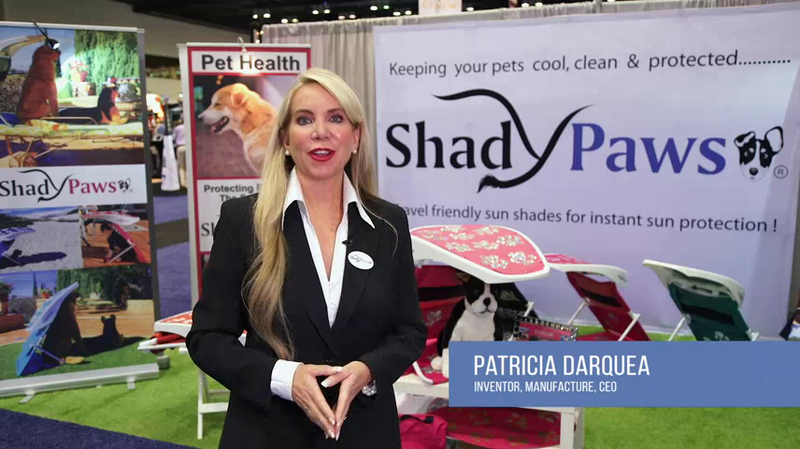 ShadyPaws, Inc. Portable Pet Canopy Sunshades, Inventor and Creator, Patricia Darquea. 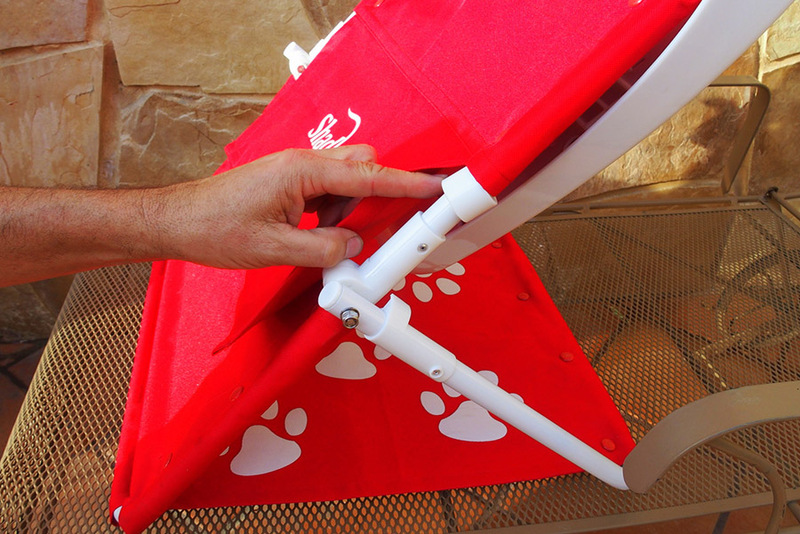 These light weight, flat folding, ABS plastic sunshades offer a cool and ventilated shade placement for small or large cats and dogs. 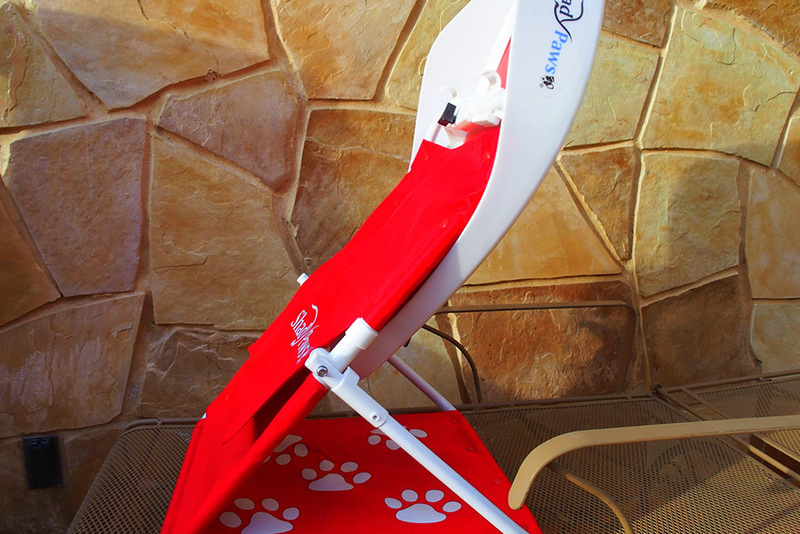 ShadyPaws, Inc. applies on outdoor chairs, lounge recliners or on the ground. 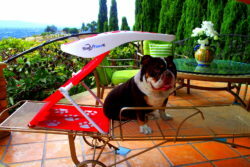 These patented SPU50+ ShadyPaws, Inc. travel canopy sunshades offers pets a light weight, flat folding travel shade product for dogs when frequenting to outdoor restaurants, social venues, parks, beaches, yachts and large vessels. Dogs and cats suffer from heat and direct sun exposure, which leads to exhaustion, anxiety and skin irritation. 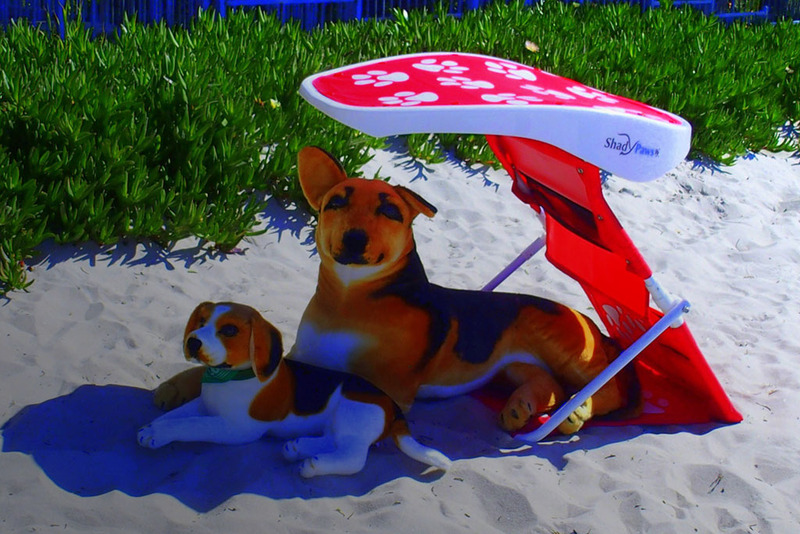 Skin cancer is another problem many dogs and cats are faced with and truly need to be protected when outdoors at all times. Long haired dogs or light skin color is another factor to keep dogs shaded. To understand why dog’s lye under tables and chairs is to realize they are hot or need somewhere to sit or lie down. 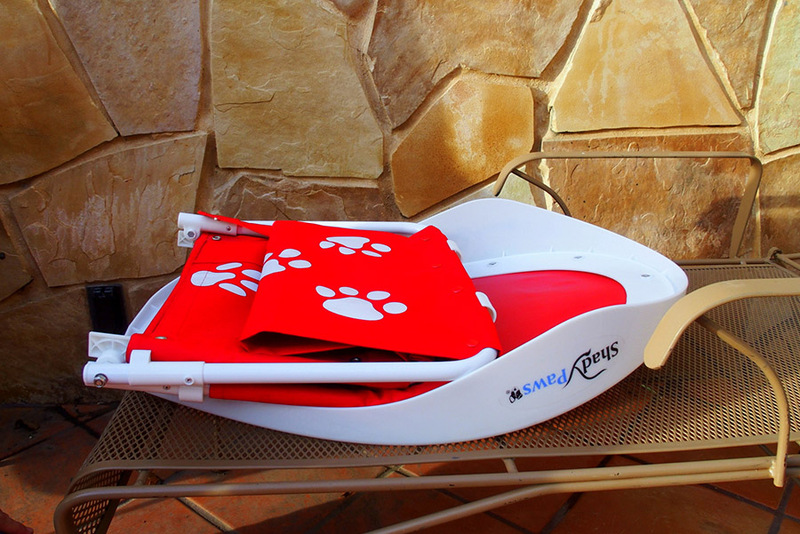 ShadyPaws Pet Canopies are the solution! 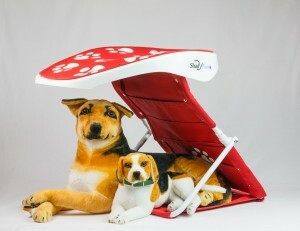 Dogs no longer need to be subjected to germs, bacteria and debris from the soiled ground and bringing this back into the home. 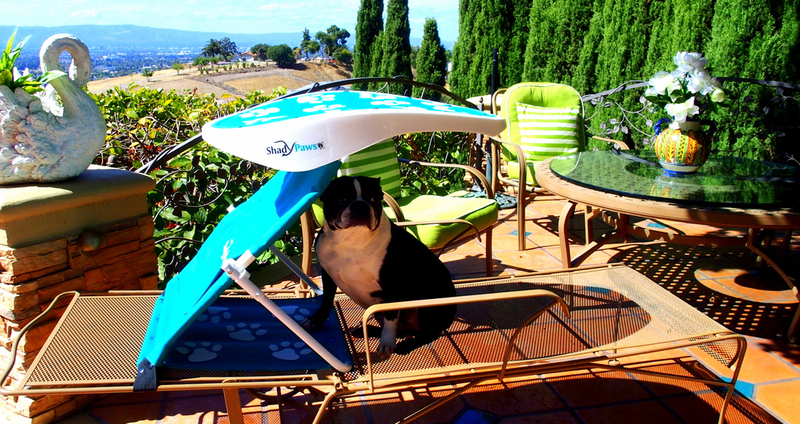 By introducing your dogs and cats to these adorable pet shade canopies, provides all animals a shade placement to cool down and rest near you. 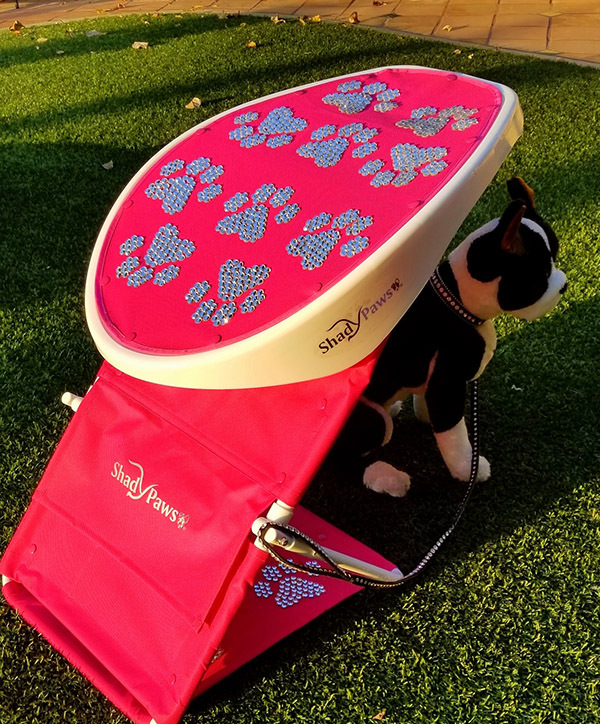 Secured pockets inside each ShadyPaws, Inc. Pet Canopies holds, leashes, treats, water and with their own scent calms down any pet when placed under their familiar environment. 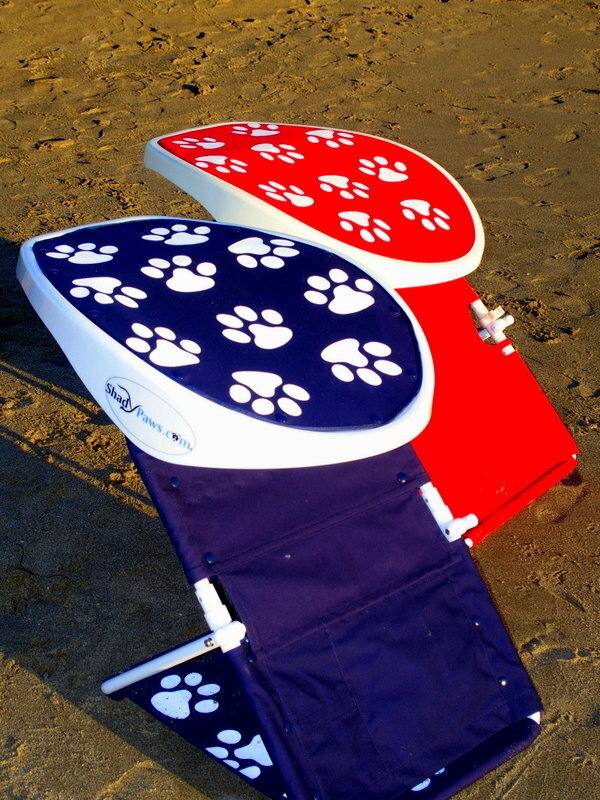 www.ShadyPaws.com – Jockey Red or Captain Navy colors with white paw print designs. 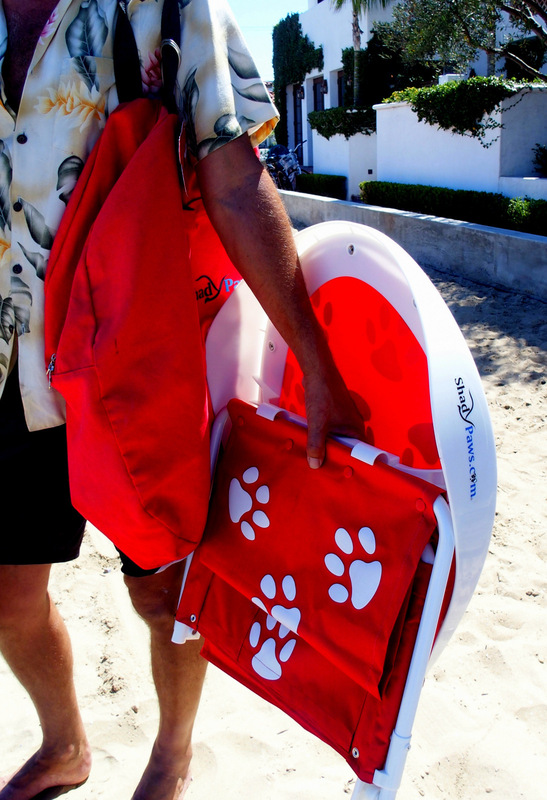 ShadyPaws, Inc. are perfect for family’s trips or business travel with dogs when flying to the Islands, resorts, hotels or vessels. 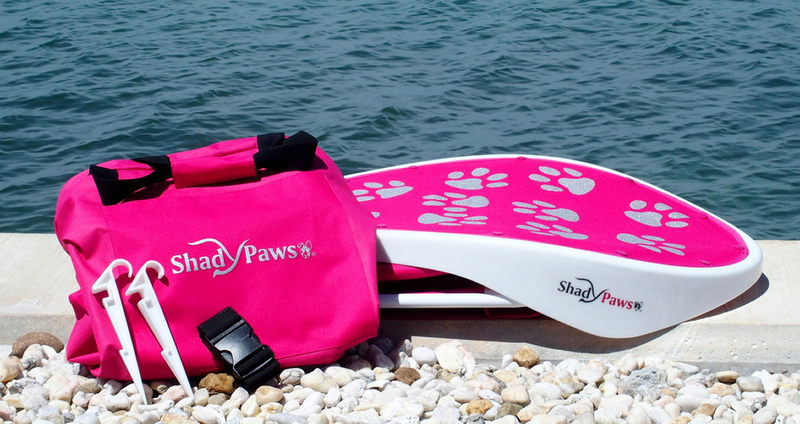 ShadyPaws, Inc. can be brought on board as a carry-on in overhead compartments or on boats and yachts. 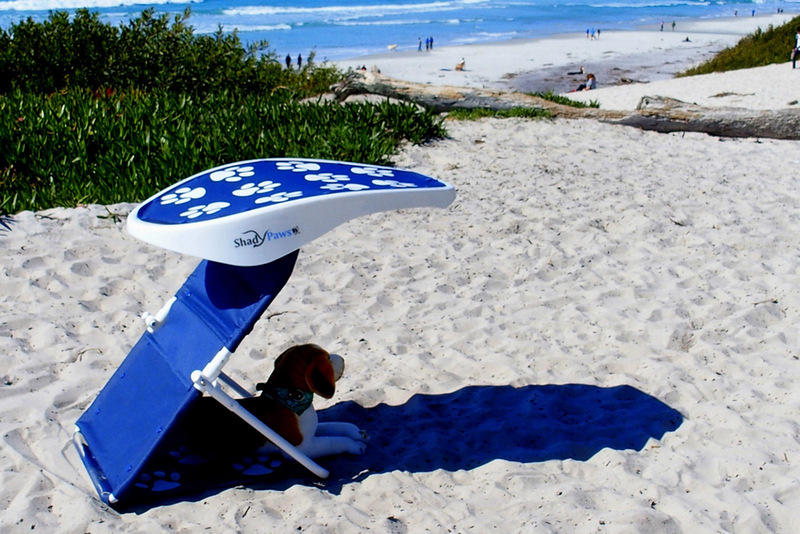 Instant shade can be achieved on ship decks, hotel pool recliners, ship to shore beach trips or any vacation destination. 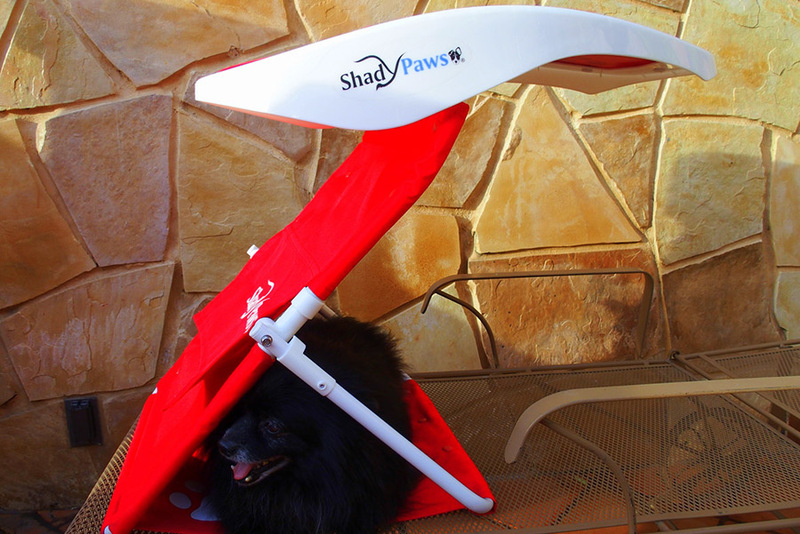 ShadyPaws Portable Pet Canopy Sunshades are flat folding and portable when bicycling to the beach or venturing out to hotels and resorts with pets. 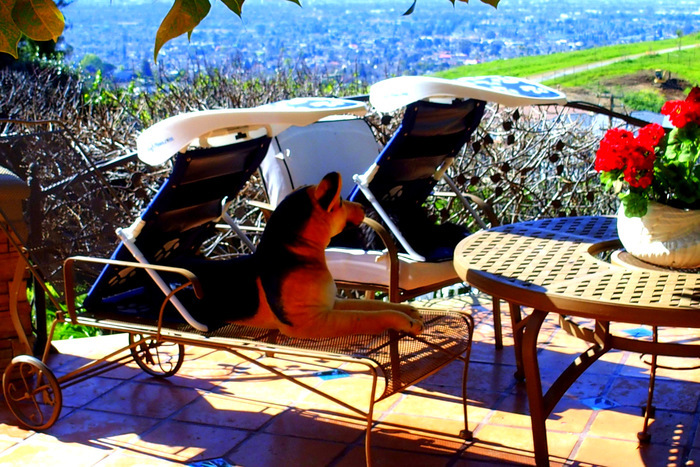 These travel pet canopies are perfect for ship to shore excursions, beach outings, lake retreats, yachting voyages or relaxing in the backyard by the pool. 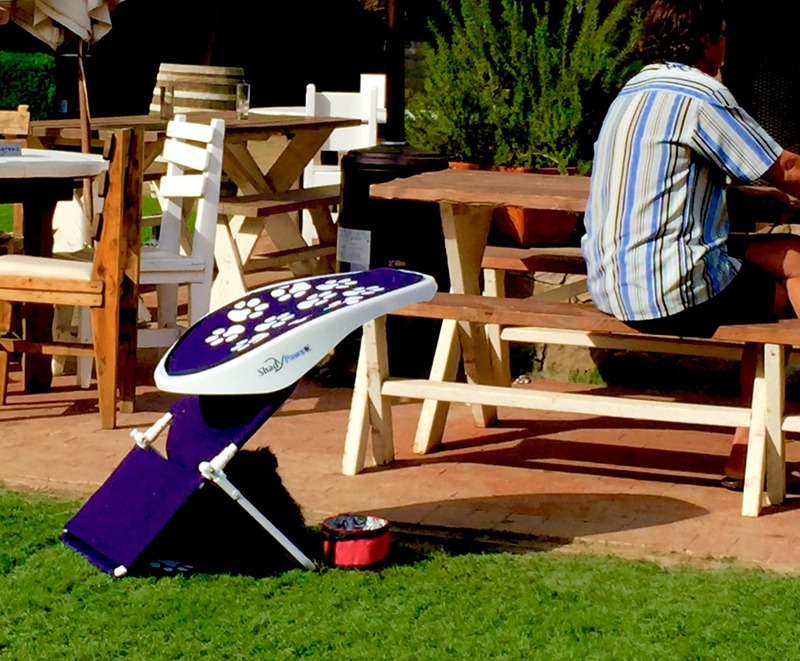 (2) large dogs or (4) small dogs can achieve extra-long shade in the afternoons or short shade when placing ShadyPaws, Inc. next to tables and chairs in restaurants, pubs, cafes and any social settings. 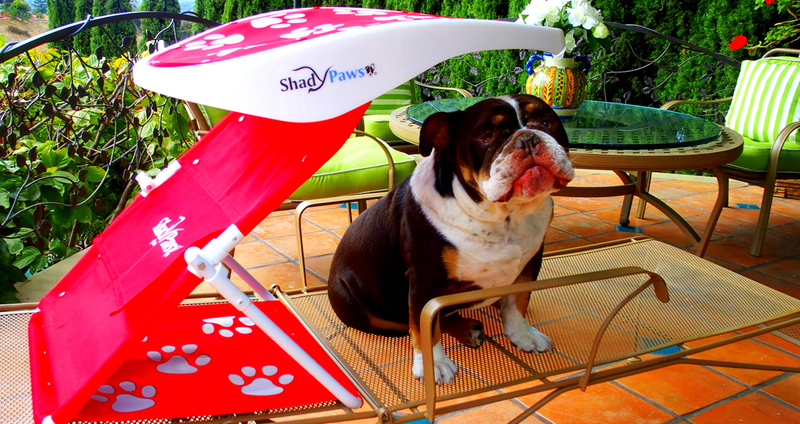 ShadyPaws Portable Pet Canopy Sunshades are terrifc for outdoor venues, restaurants, or social events! 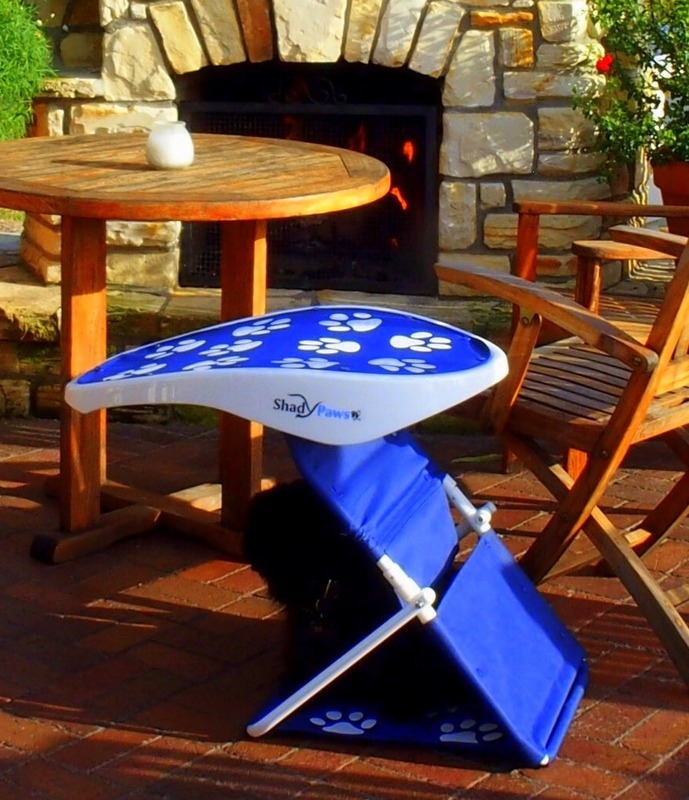 Keep your dogs from suffering in the heat or crawling under dirty tables to escape the heat. 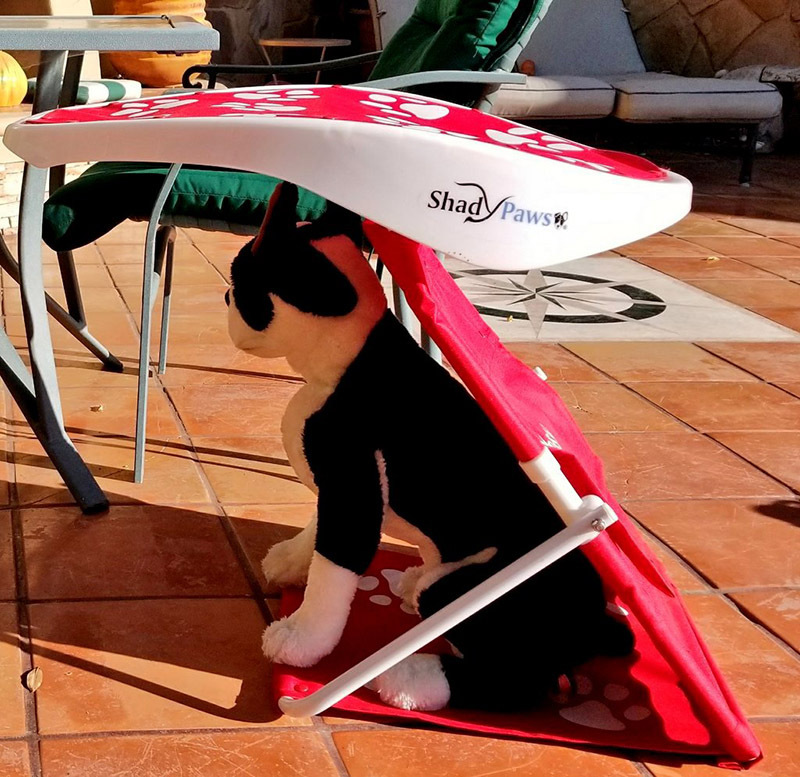 ShadyPaws Portable Pet Sunshades SPU 50+ Restaurant and Camping friendly. 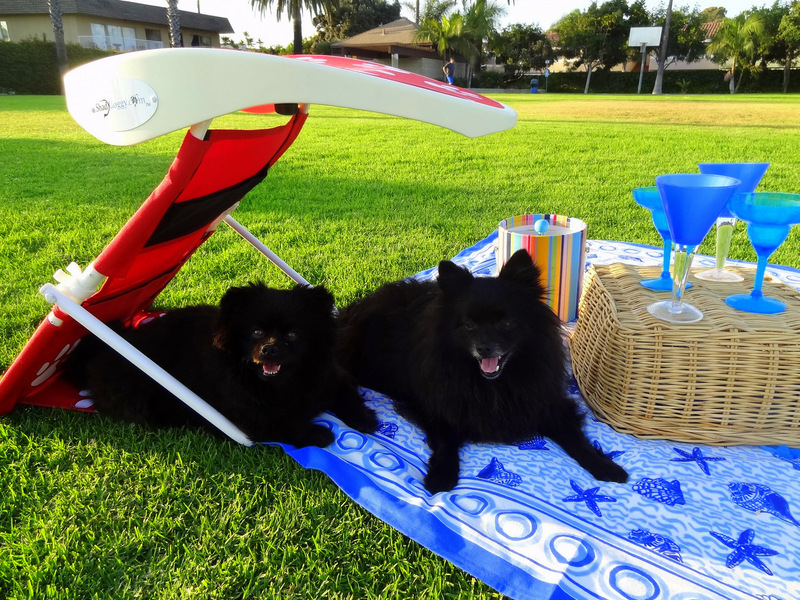 ShadyPaws Portable Pet Canopy Sunshades are terrrifc for park or camping applications. Dogs suffer from heat exhaustion and or skin cancer. 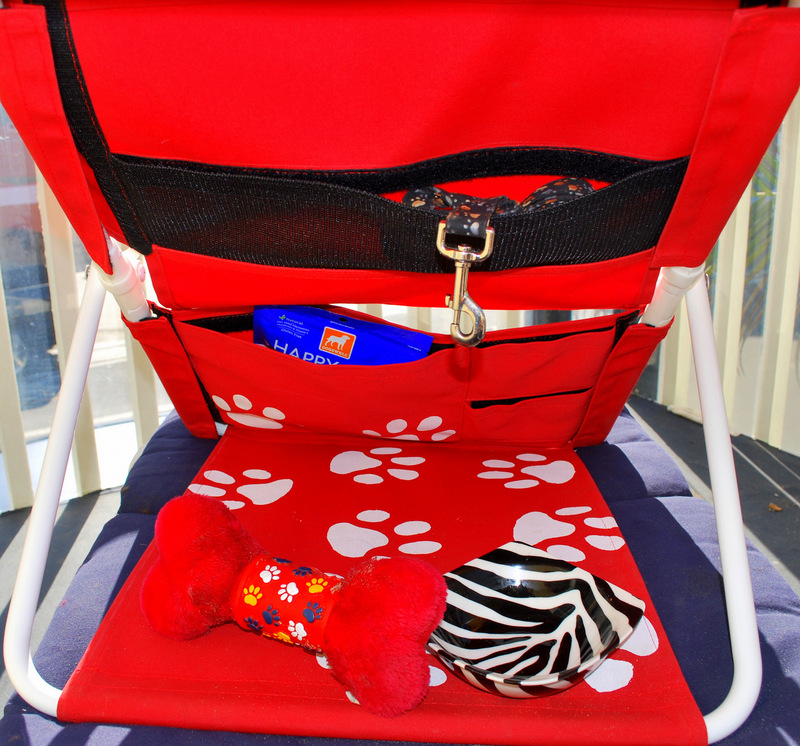 By shading your pets early in life avoids the harmful dangers to dogs. 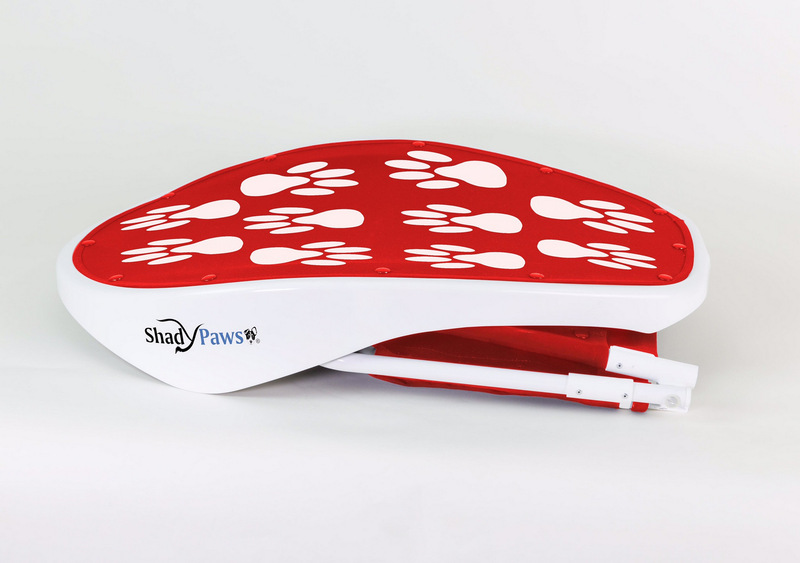 ShadyPaws Portable Pet Canopies offer multiple Velcro Pockets to secure all treats, water bowls, leashes, toys and all essentials necessary to keep your pups content! 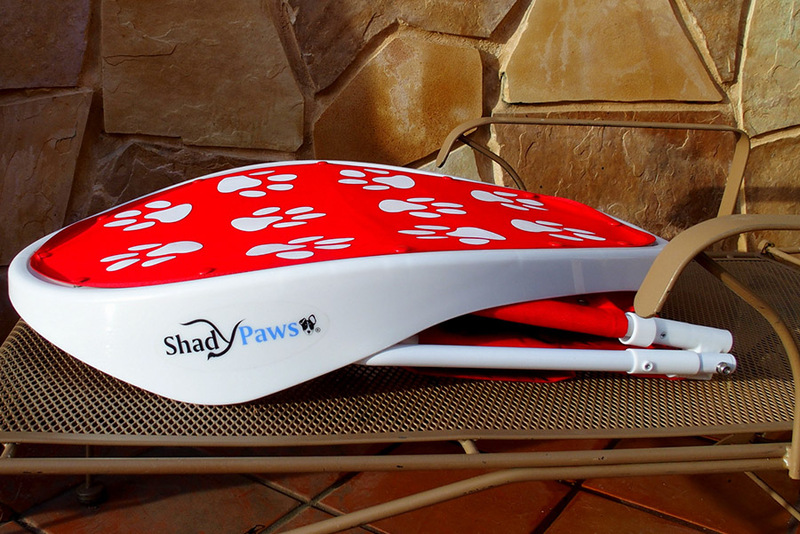 ShadyPaws Travel Canopies are light weight & flat folding for 1,2 or 3 pets providing heat protection with instant shade anywhere! 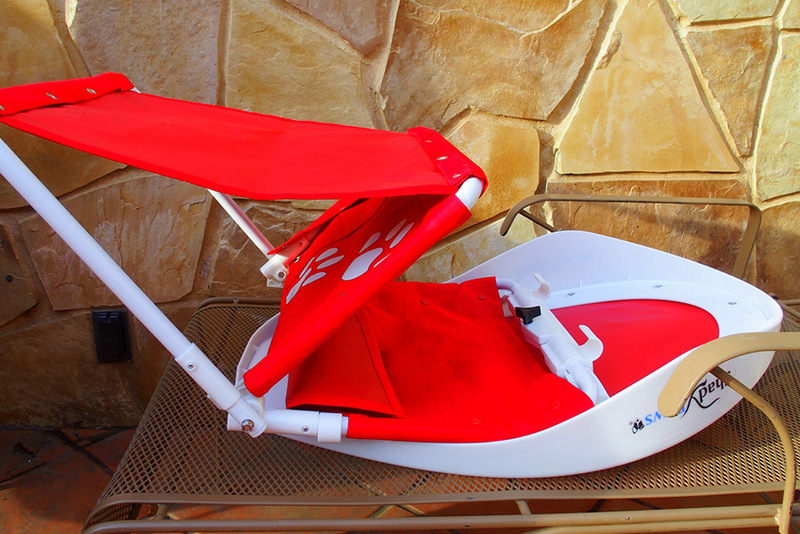 Great for outdoor restaurants, beaches backyards, parks, etc. Always carry water when outdoors with your pets! and fold the ABS canopy downward. 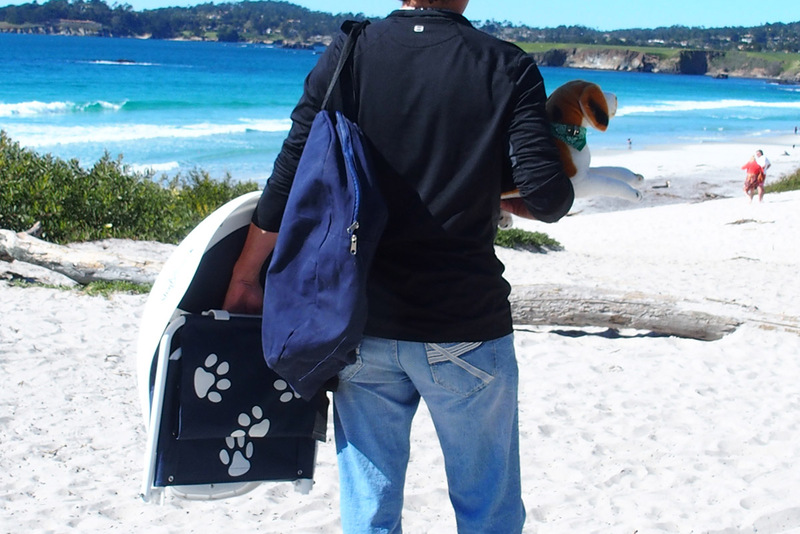 or carry alone for your next trip with your best friend! 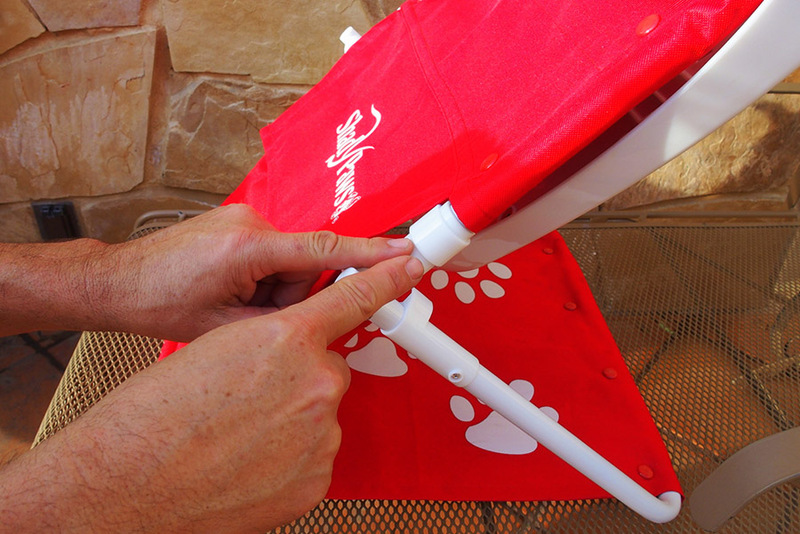 ShadyPaws Travel Canopies are light weight & flat folding for pet heat protection with instant shade. 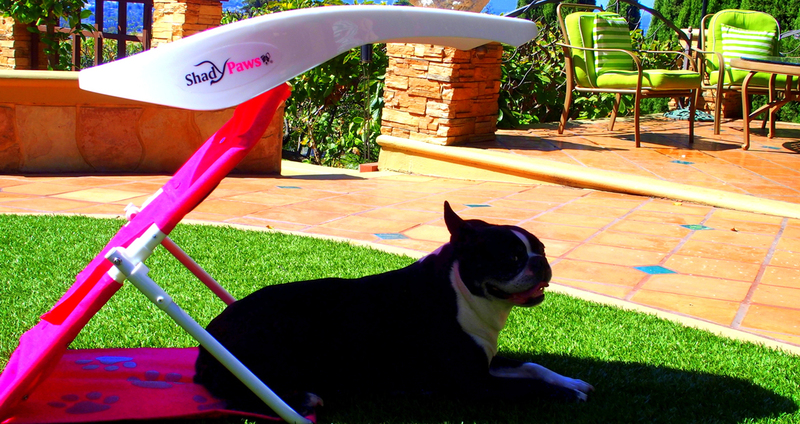 ShadyPaws Travel Pet Canopies include a carry bag, ground spikes & furniture belts for any outdoor shade setting. ShadyPaws is perfect for any pet …. the perfect atmosphere for their comfort and security! 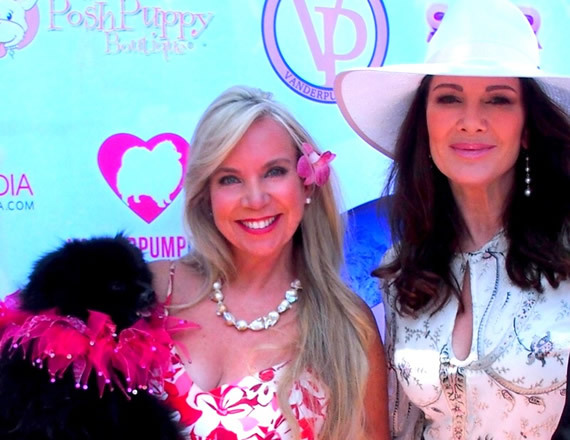 Proceeds of sales goes into the Lisa Vanderpump Dog Rescue Foundation. Creating awareness regarding the dog torture for meat trade industry. 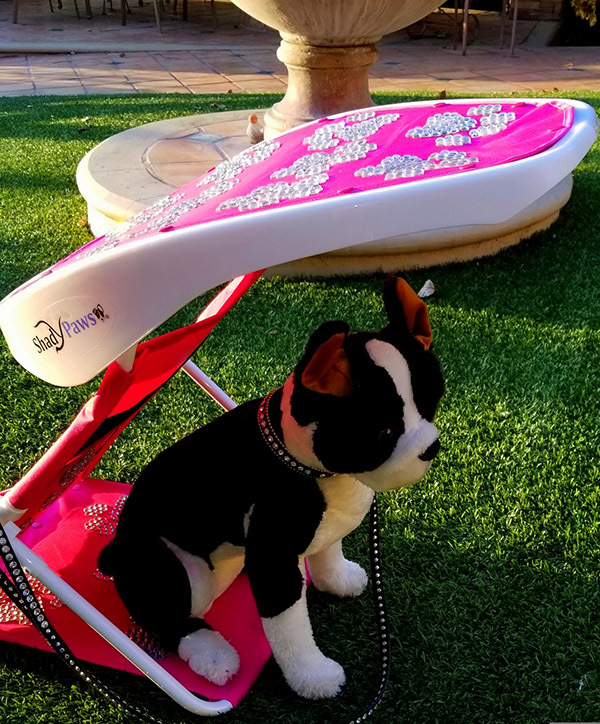 Every person who buys this fuchsia pink pet canopy lavished in rhinestone paws is creating awareness to stop the black market dog meat trade industry and to save the animals from death by helping to rescue dogs from China. 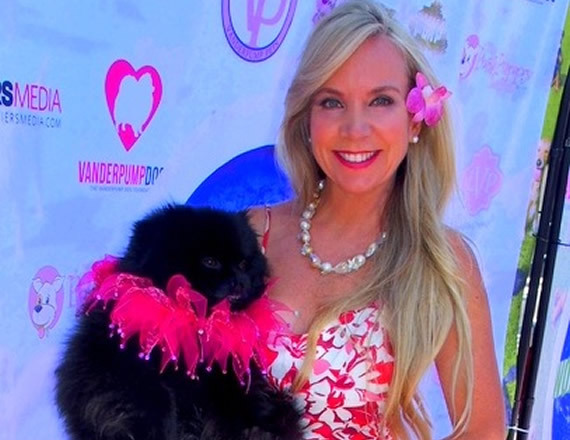 The event seeks to celebrate dogs around the world, while simultaneously raising awareness and contributions for the Foundation’s initiatives. The event is open to the public, particularly our furry friends, as there will be various booths and activities for dogs. 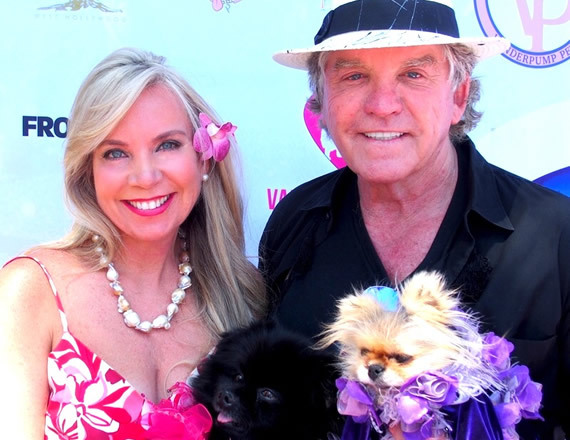 The Foundation is planning to offer an agility park, a dog spa and boutique, a dog trainer, dog contests, a pet psychic, and more!